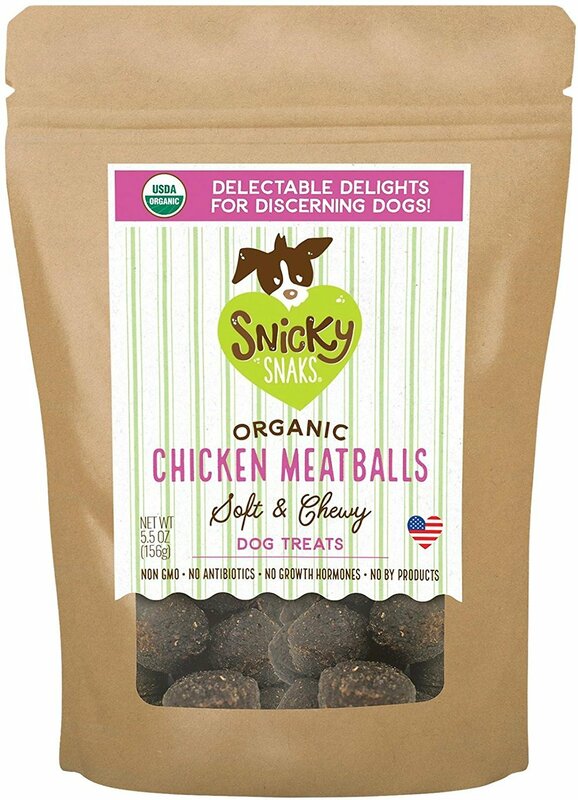 Give your well-behaved pup a truly rewarding treat with irresistible Snicky Snaks USDA Certified Organic Chicken Meatball Dog Treats. 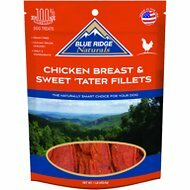 100% organic chicken containing no antibiotics or growth hormones is the very first ingredient. 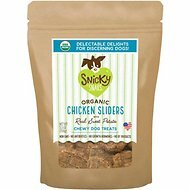 Made using only the highest-quality organic, US-sourced ingredients to deliver exceptional taste and nutrition, these savory morsels are great for snacking and also make the ideal reward or training treat when broken into small pieces. 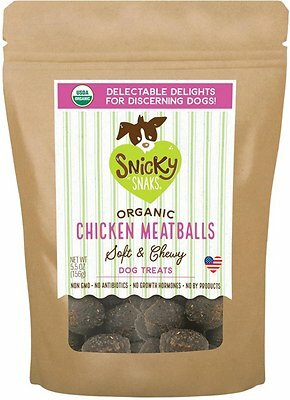 Like all Snicky Snaks treats, these tasty tidbits contain absolutely no sugar, salt, preservatives, artificial colors, artificial flavors, wheat, corn or soy. 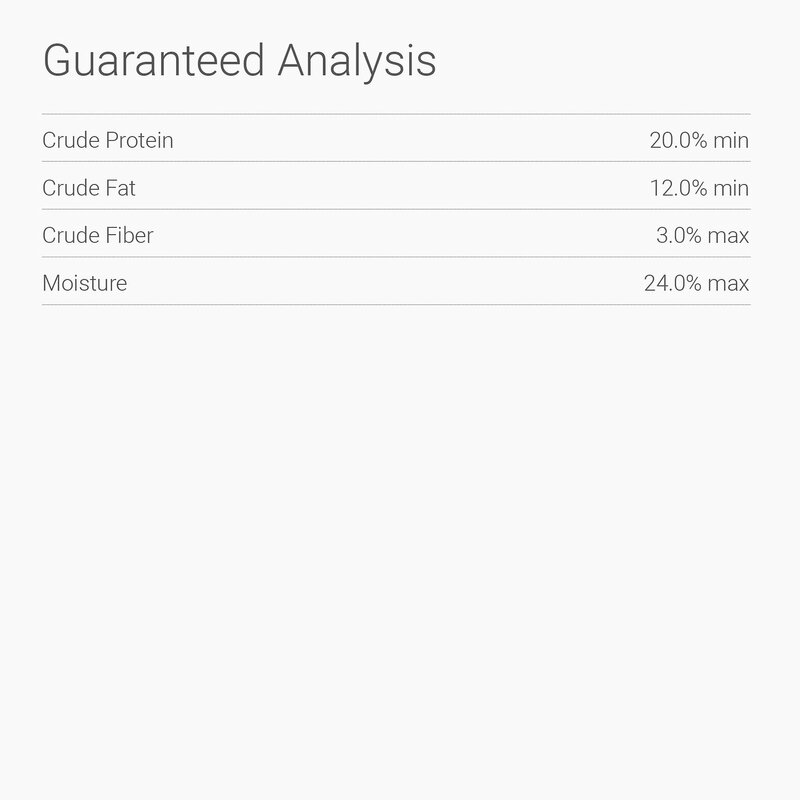 Organic Chicken, Organic Oats, Organic Barley, Organic Sugar, Organic Molasses, Organic Brown Rice, Non-GMO Vegetable Glycerin, Organic Dried Cultured Skim Milk, Salt, Citric Acid, Rosemary Extract, Mixed Tocopherol (a preservative). We keep these in the room by our garage, so when we don't want him to follow us we say stay & when we get back, he's always right there waiting for his treat!! 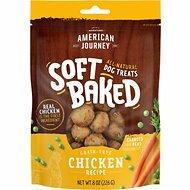 Our dogs LOVE the chwey treats. All of them stand in line, hoping for more, when treat time comes around. The figured out where the treats are located, and started pointing to the treat cupboard, wanting more. Can't buy them fast enough, when we run out !! These are rather hard treats for being in the shape of balls. If I were to give one of these to my dogs whole, it could EASILY get lodged in their throats. I had to cut each one in half with a knife because of how hard they are. My Dog Max love these meatball . very happy with products.